On many properties, finding a good site to place artificial nest cups is difficult. Barn swallows demand adequate protection of the nest from rain. Modern homes often don't have adequate overhang of the eaves to provide this protection. Also, placing nest cups under the eaves of a two story house is more than many home owners want to attempt. The use of shelters specifically designed for barn swallow nesting has become a feasible idea when fitted with artificial nest cups. The presence of nest cups greatly increases the chances of such structures being used by swallows. The most basic structure is a wall mounted single nest shelter. This shelter allows the nest to be placed anywhere on a wall rather than just up under the eaves or on a porch. The roof should be adequate to prevent blowing rain from reaching the nest. I will be trying several single nest shelters this spring, testing both horizontal and vertical spacing on the wall of our barn. The swallows may not be interested in nesting at multiple levels, but it's worth a try since an entire colony could then be housed on a single wall. the 4 single shelters on the barn wall The heated bat box is on the upper left. 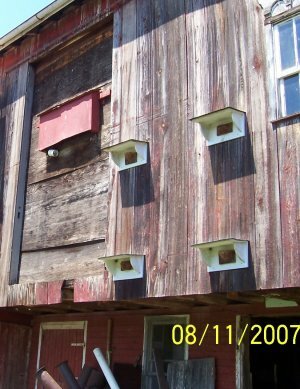 2008 update - The individual swallow shelters on the barn wall were never used. They were placed above the main entrance to the barn colony room where swallows were continually flying in and out. I don't know if swallows would never use such single shelters or if they simply preferred to crowd into the colony room below. Swallows may also prefer completely open sides, rather than the abbreviated wood roof supports on these prototypes. A metal angle bracket could support the roof while leaving the sides unobstructed. However, at this point, I would not recommend the single nest shelter in any form. A simple free-standing multi-nest shelter is a gable roof mounted on 2 posts, much as a wishing well roof, only longer. The shelter should have a ceiling and a 1 ft apron on all four sides. The nests can be mounted on the inside of this apron or back to back on a board running down the center. On the 4 ft wide version, nests can be mounted on both sides and on the center board. The nests should be at least 8 ft. above the ground. An even higher structure with the nests around 12 ft. above the ground may be more appealing to the swallows, especially if humans are a problem in your area (children with long sticks). However, this tall a shelter is more difficult to build and the nests will be less accessible for monitoring and emptying. Where human traffic isn't heavy, an 8 ft. shelter may be preferred. Similar shelters wider than 4 ft require 4 corner posts. Nests may be placed on several boards running along and perpendicular to the ceiling. Nests can be placed on both sides of the boards, or if closely spaced, on one side only. An ideal pattern of nest placement has not yet been determined. Careful observation of new shelters fitted with nest cups, noting which cups are used first and which are not used is a useful research project for anyone building such a shelter. If the joists run across the width of the shelter rather than end to end, a single nest placed on each joist would not be in the line of sight of any other nest. This arrangement should be tried, but, several nests in view of another nest should also be tried. Swallows often seem to spread out within a colony room, seeking the maximum space between nests. However, I have frequently observed two pairs of swallows choosing to nest fairly close together, especially when they are nesting at a new site. Like most animals, swallows spend a great deal of time and effort trying to avoid being eaten. A benefit of colonial nesting is that each bird can spend less time watching for predators, relying on other members of the colony to share the watch. Having another pair nesting close by and in line of site may be reassuring to the swallows. I set the posts today for an 8x12 shelter which will have 12 nest cups. Hopefully it will be finished before the swallows return. 2008 update This shelter is illustrated above. It was removed last fall to make room for new construction. I'll add a page on this shelter soon, explaining the purpose of the metal partition in the center and the bizarre behavior of one male swallow. 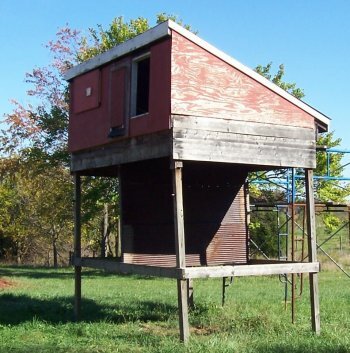 Where a shed or other outbuilding is present, another option is to attach a lean-to on the side of the building, supported at the other end by 2 or more posts. Care must be taken that the roof and supports are strong enough to hold a snow load, including what might slide down the roof of the shed. Unless the roof is in afternoon shade and has a shallow slope, there should be a ceiling above the nests to protect them from overheating and to allow proper nest placement with 2" clearance above the rim. The resulting attic should be vented at each end. Or, better still, in hot climates, the attic should be insulated. The eaves of many small sheds are too low to allow an 8 ft. lean-to addition. Swallows have accepted nest heights of 6 ft in sheds or other sites where they are seldom disturbed. But, if possible, 8 ft. is a safer minimum height. A somewhat lower entrance is no problem and may actually be preferred. An entrance lower than the nests gives greater protection from the weather as well as from prying eyes of passing predators. The 12 inch apron around the top of the shelters illustrated above allows nests to be placed at the edges of the shelter with total protection from the weather. This maximizes the number of nests that will fit in a given size shelter, however they are arranged. The above information does not cover the methods of construction of the free standing shelter. The method you choose is immaterial to the swallows and should fit your needs. The shelter must be sturdy enough to withstand wind and snow load and the nest area must be protected from the weather. Very economical shelters can be made from materials at hand, such as left over shingles and 2x4's from a construction job. On the other hand, an elaborate shelter with decorative trim or a design to match your house may be an interesting addition to your yard. A store bought gazebo would make an ideal, if expensive, swallow shelter. The swallows won't care which you choose. Their interest lies in weather protection, height of nests, placement of nest in relation to other nests, and protection from predators. As swallows colonize your shelter, records should be kept of which nest cups are used and what relation they have to other nests. This will help establish a minimum distance acceptable for the following conditions. A. Distance between nests mounted on a common joist. B. Distance between facing nests on adjacent joists. C. Distance between nests on opposite sides of a joist. These are not in line of site of each other. Since there is no guarantee that swallows will colonize a shelter that you build, the idea of a secondary purpose for this structure is worth considering. Simultaneous dual use A storage shed, car port, or other structure may be fitted with swallow nest cups if a window or door can always be left open and the droppings from the swallow nests can be tolerated. The droppings will be confined to the area directly below each nest and can easily be collected on a newspaper or plastic flower pot. Seasonal dual use The swallow colony will use a shelter only during nesting. In Maryland, this is from mid April to early August. This allows the shelter to be used for winter storage of such items as lawn furniture, or maybe a riding mower, if you use one of those things. Secondary use Until the swallows take up residence in your shelter, a secondary use will take the pain out of having an unused shelter. This use should not interfere with the appeal of the shelter to swallows, or they may never come. Gazebos are an ideal secondary use structure. 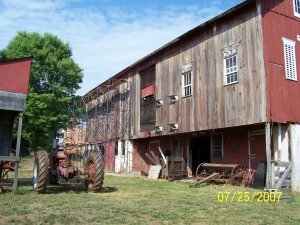 &COPY; 2002 - 2012, American Artifacts and Richard Van Vleck, Taneytown, Maryland.